Box Text: The most crucial and decisive battle of World War II is about to be fought...by you! Enemy forces are descending upon Midway Island. Enemy bombers, dive bombers, and zeros are roaring over the island like a typhoon. The surrounding Pacific waters are teeming with enemy aircraft carriers. As the top gun of the Navy's most elite crew of fighter pilots, you must pilot your specifically-outfitted P-38 into the very midst of the enemy squadron. Equipped with an array of secret weapons, only you can turn the tide against the formidable enemy fleet. The outcome of history's most fateful air/sea battle rests in your hands! Can you avenge Pearl Harbor? 12-21-2016 ApolloBoy Box Text The most crucial and decisive battle of World War II is about to be fought...by you! Enemy forces are descending upon Midway Island. Enemy bombers, dive bombers, and zeros are roaring over the island like a typhoon. The surrounding Pacific waters are teeming with enemy aircraft carriers. As the top gun of the Navy's most elite crew of fighter pilots, you must pilot your specifically-outfitted P-38 into the very midst of the enemy squadron. Equipped with an array of secret weapons, only you can turn the tide against the formidable enemy fleet. The outcome of history's most fateful air/sea battle rests in your hands! Can you avenge Pearl Harbor? 11-16-2012 exonerator Box Text The most crucial and decisive battle of World War II is about to be fought...by you! Enemy forces are descending upon Midway Island. Enemy bombers, dive bombers, and zeros are roaring over the island like a typhoon. The surrounding Pacific waters are teeming with enemy aircraft carriers. As the top gun of the Navy's most elite crew of fighter pilots, you must pilot your specifically-outfitted P-38 into the very midst of the enemy squadron. Equipped with an array of secret weapons, only you can turn the tide against the formidable enemy fleet. The outcome of history's most fateful air/sea battle rests in your hands! Can you avenge Pearl Harbor? 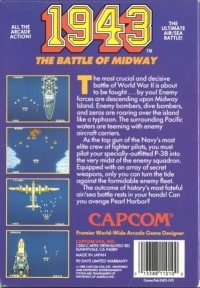 This is a list of VGCollect users who have 1943: The Battle of Midway in their Collection. 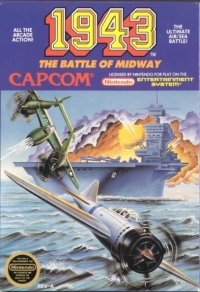 This is a list of VGCollect users who have 1943: The Battle of Midway in their Sell List. 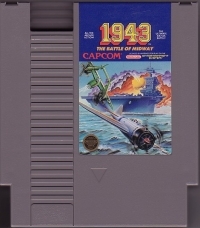 This is a list of VGCollect users who have 1943: The Battle of Midway in their Wish List.